Las Vegas, Nevada (UroToday.com) Dr. Ahlering gave the first talk in the NARUS 2019 meeting in Las Vegas, after receiving the prestigious Menon Award. His talk encompassed several important and controversial topics in prostate cancer including Extraction site incisional hernias, Lymph node dissection, Adjuvant radiation therapy, and Task force recommendation on prostate cancer screening. A ventral hernia at the extraction site after robotic prostatectomy was reported initially in 2011.1 Ever since there have been several additional reports indicating that the incidence of this is approximately 5.3%. Data have shown that the rate of an incisional hernia varies whether the incision is vertical or horizontal. The rate of horizontal incisions is higher when compared to vertical incisions (figure 1). Therefore, the recommendation is to perform vertical incisions. The next topic discussed was the necessity of performing pelvic lymph node dissection in radical prostatectomy. 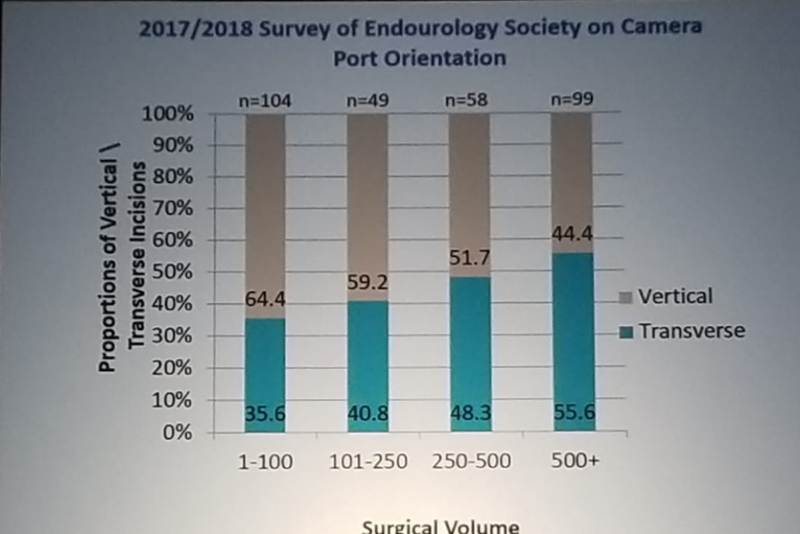 Dr. Ahlering presented a study assessing the yield of lymph node dissection, including 220 patients form two high-volume institutions, who underwent radical prostatectomy without adjuvant treatment between 1990-2015. 2 A total of 21 patients had seminal vesicle involvement, (pT3b) and did not undergo pelvic lymph node dissection. The study demonstrated that greater lymph node yield did not influence biochemical recurrence rates, but higher PSA and biopsy Gleason >8 were associated with an increased risk of biochemical recurrence. In that light, omitting the pelvic lymph node dissection appears to represent a much better option according to Dr. Ahlering. He continued and stated that a negative pelvic lymph node dissection does not mean that there are no lymph node metastases. On that same note, the removal of positive pelvic lymph nodes does not mean that the patient is cured, and pelvic lymph node dissection has not been shown to reduce biochemical recurrence rates. Additionally, it is important to remember that pelvic lymph node dissection entails a 5-20% risk of lymphocele complication. Dr. Ahlering believes that the added harm of pelvic lymph node dissection might outweigh its benefit,4 and salvage pelvic lymph node dissection might be better. Next, Dr. Ahlering discussed the role of adjuvant radiotherapy in the surgical treatment of prostate cancer. He mentioned the SWOG 8794 trial5 which demonstrated an overall survival benefit in patients treated with adjuvant radiotherapy (with a median of 15.2 vs. 13.3 months) and metastasis-free survival advantage of 1.8 years, as shown in figure 2 and 3. However, when looking closely at the patients in the SWOG 8794, Dr. Ahlering stated that the groups were not equal at randomization. He pointed out that the observation group was on average 1.7 years older than the group of patients who received adjuvant radiotherapy. Furthermore, there was a difference in the grade of the groups, with the adjuvant group demonstrating 9% having Gleason grade 8-10 compared to 16% of the observation group. This could potentially explain the differences in the overall survival and metastasis-free survival demonstrated between both groups. So far, not one study has shown a benefit in reducing metastasis and cancer-specific mortality when patients are treated with adjuvant radiotherapy. Hypothetically, this could be because radiotherapy can destroy the ability of prostate cancer cells to produce PSA, but it does not kill the cells. The last topic discussed was the most recent recommendation of the US Preventative Taskforce regarding PSA screening. According to this controversial recommendation, PSA screening has been deemed not beneficial. Unfortunately, this has resulted in an increase in the incidence of more aggressive prostate cancers, as it is not diagnosed early enough, as shown in figure 4, demonstrating work done in several centers in the US, led by Dr. Ahlering. This work also demonstrates an increase of 345%! In lymph node involvement through the years (Figure 5). Dr. Ahlering summarized his talk with an interesting idea. He stated that there are approximately 100,000-125,000 radical prostatectomies performed per year in the US. There are ~7000 urologists in the US doing “any” radical prostatectomy surgeries. Dr. Ahlering proposes to form centers of excellence, where the top (10% - 700 surgeons) would work and do all radical prostatectomies, so that each surgeon would cover 140-180 cases per year, in a goal to achieve the best outcomes for each patient.